The company has promised to build the all-electric Leaf in the USA starting next year. To make that happen, they've begun testing motor building for the car at their Decherd, Tennessee facility. 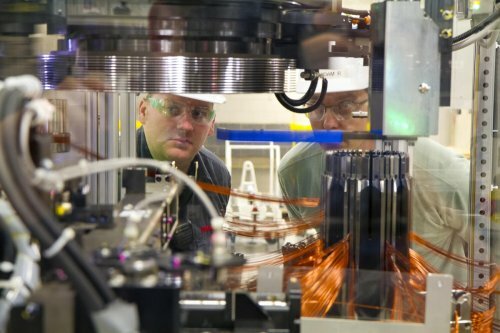 The electric motor that powers the all-electric Nissan Leaf has more than a mile of copper wire in it. The winding of that motor, like any other automotive electric motor for propulsion, is extremely complex and very exacting. The tolerance for error is very slim. So building an electric motor is not as simple as it might appear. In fact, it requires more time and manpower than a combustion engine does, so the testing process is intense. Nissan began that process at its Decherd, Tennessee plant this week in order to meet eMotor production capability in time for the 2013 Nissan Leaf production at the nearby Smyrna, Tennessee plant late this year. The lead trainer for the employees who're going to be building these motors is Adam Reed, who spent six months in Japan learning how to get it right. As you can see from the video below, it's a complex and exacting process. "The winding takes place on a very complex piece of equipment," said Reed. "It has two parts at a time traversing inside the equipment going in different directions. So it's very hard to keep up with sometimes." The first 2013 Leaf is to roll off the line in Smyrna just before Christmas. Several cosmetic changes are being made to this next model in order to lower costs to improve the vehicle's street appeal.